Smelling perfume is my favorite self-mesmerization technique. There's nothing like huffing fancy French fumes to still the squirrels running wild in my head. It's a ritual: drain the brain, spray the scent, breathe, allow colors and words and images to fill the mind. And repeat. And repeat. The sparky folks behind The Fragrance Lab, the interactive perfume experience at Selfridges department store in London, have tapped into the soul medicine approach to scent appreciation with their imaginative installation. 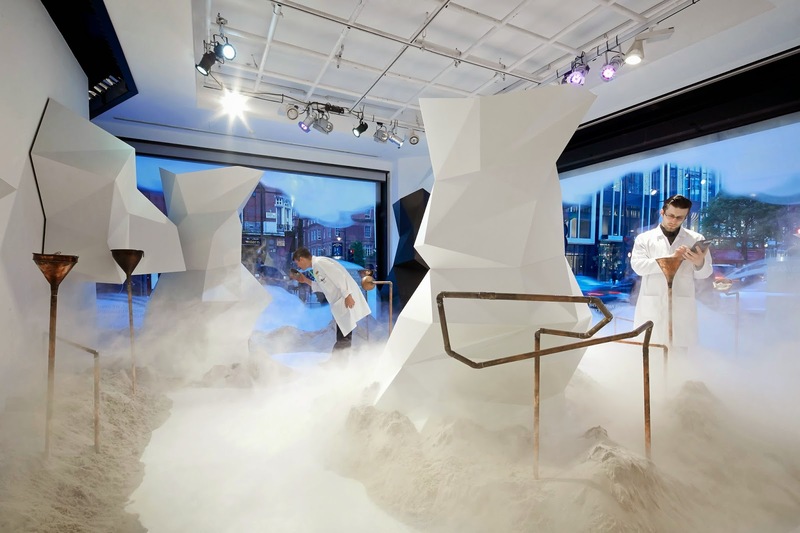 Trend forecasters The Future Laboratory, along with flavors and fragrance firm Givaudan, have cooked up a cross between A Clockwork Orange's fetishistic futurism and a carny funhouse, and stuffed it into the front corner of the storied Oxford Street emporium. Smelling unidentified odors in this theatrical setting encourages playfulness and free association. The focus is a psychological one, rather than a celebration of brands. A team of four Givaudan perfumers created the exclusive matrix of fragrances for Selfridges: Louise Turner, Nadège Le Garlantezec, Shyamala Maisondieu and Antoine Maisondieu. First comes the futurism, in a spacey white waiting reception area filled with perspex, laboratory beakers, and white-coated assistants. I sit on a spindly stool and answer a multiple choice questionnaire on a floor-mounted tablet. Cryptic images flash by on the screen: a hand dripping with goo, watermelon cut into geometric shapes, a woman's face masked by a pool of purple latex. And statements to agree or disagree with -- about my perfume shopping tactics, the mood I'm after, the influence of friends and pop culture. I click yesses and nos as fast as I can, resisting the urge to analyze the questions. Then comes the carny funhouse. I'm given sleek white headphones plugged into an audio guide. A man's creamy caramel voice fills my ears, instructing me to ascend the white staircase in the corner of the room. After a beat, Creamy Caramel Voice urges me through a series of secret rooms, through which I move completely alone. The environment is Alice-in-Wonderland-strange, each room a different shape and size, some dark, some light, some filled with quotidian thingamabobs, others empty. I've completely forgotten that I'm on the floor of a vast department store. And I'm probably a great candidate for a cult, because within half a minute I'm obediently following all of Creamy Caramel Voice's commands. I'm variously instructed to stop, go, close my eyes, open my eyes, explore secret drawers, sniff random knick-knacks, summon memories, conjure associations. I emerge into the final room, which I'm startled to discover is in the front windows of Selfridges, in full view of buses and taxis and people people people. But as I'm now fully programmed by Creamy Caramel Voice, I continue to methodically smell every object in my path. I'm sticking my nose into a copper trumpet of scented pebbles when I notice a man in a white lab coat through the haze of a smoke machine. He has chocolate eyes and a gentle demeanor, and in my newly porous, cult-member condition, I instantly fall in love. I follow him into a shiny-curtained cubicle, where Aiden, as he turns out to be called, gives me a customized perfume consultation. This is the “fragrance prescription” part of the experience. What follows is a something akin to a psychic reading: comforting and flattering comments about one's personality based on visual clues (clothes, body language), padded out with insights derived from the multiple choice quiz from the beginning of the “journey”. My romantic self is going “aw shucks”, while my charismatic self is telepathically willing Aiden to fall in love with me. My ESP assault grinds to a halt when Aiden shares that he came out to his dad when he was 15. Yeah, we're getting deep in that cubicle. After Aiden asks me searching questions about my relationship to perfume and the nature of what I seek to project and protect about myself, he reveals my fragrance prescription. It's a bottle labelled Two Hundred and Forty Seven, and I cautiously sniff the spritz on my arm. I'm surprised that it's so...me. It's a spicy/woody patchouli number, which is right in my perfume wheelhouse. I'm not crazy about the strong nuance of sweet vanilla, but overall, Two Hundred and Forty Seven is a pleasant evocation of smoke and whiskey and leather. Being perfumedly promiscuous, I ask if Aiden has any back-up choices. He produces another numbered bottle whose juice I find too banal, too candy/fruity. When I'm not swayed by his insistence that it smells fantastic on me, he tries a final option. It's a Comme des Garçons-esque, plasticky-on-purpose synthetic composition. I realize that Two Hundred and Forty Seven is as close to right as we're going to get. The next day, I run Two Hundred and Forty Seven past my frag fanatic friends Alison and Lisa. “It smells like cheap Chinese Five Spice mix,” says Alison, wrinkling her nose. “It smells like plasticine and Molecule 01!” Lisa chimes in, enthusiastically. She likes the smell of plasticine and Molecule 01. After giving it a few minutes on the skin, Alison starts to come around to its charms. “Now it smells like burnt toffee,” she offers. “Like honeycomb crisp -- a Crunchie Bar!” Lisa cries. It seems one gal's whiskey is another woman's plasticine and Chinese Five Spice, but regardless of my perfume prescription, I adored my time in the Fragrance Lab. The Fragrance Lab runs until this Friday, June 27th, and if you're a perfume lover in London, I urge you to experience this playful and thought-provoking framing of our relationship to smell. The Fragrance Lab is at Selfridges until June 27th. More details here. Oo, making my day a little more fun. And badly needed. Love the sunglasses in your photo! You look totally hip. Thanks NB. I sneak the sunglasses into many non-sun situations, owing to the convenient built-in "eyeshadow" provided by the gradient tint. Pooka! What a cool idea! Sorry I've been away - got married two weeks ago, got a new job as a perfume guru for a shop in NH, and so on. I would love to stage something like this! Stefush, the "and so on" is what cracks me in this context, as if it's merely a "to do" list! But what a to do! Congratulations on getting hitched and the fun new job! Oh, congratulations, Stefush! How nice. Sounds like the year of the horse is turning out to be a really great one for you! Concerning the "and so on" reminds me of when I called a friend of mine on my wedding day (it was a very, very small, family-only wedding) and he said to me, "Uh...aren't you supposed to be somewhere?" This sounds like a complete riot, with bonus - albeit unobtainable - eye candy. And in a spooky coincidence, I had a Crunchie the other night for the first time in ages. It set my teeth on edge with its sweetness, but it was magnificent. Well, I reckon Two Hundred and Forty Seven has a place in your wardrobe somewhere, even if it isn't quite the full 'Portait of The Lady' in olfactory terms. Vanessa - 247 wasn't a full portrait of this lady, anyway - more like a quick impression glimpsed in passing. But I still enjoyed the combination of armchair psychology, fake science, and real theatricality of the experience. Pinkcash, I don't think Aiden knew who I was...though he may have known I was a journalist. At one point in his "reading", he surmised that I was a "critical" person, and that's because I was standing there in my standard interview position, one arm akimbo, peppering him with questions. Hey all - yeah, it's been a whirlwind lately. Love of My Life? Check. Absolute dream job curating a perfume shop? Check. The "To Do" list part only seems like that in the past tense. So happy to be back in Puckrikiverse, though! This makes me smile. Congratulations again, Stefush! Wishing you all the happiness in the world!